From the South Downs to Milan, a range of diverse projects spanning the globe have received accolades at this year’s Landscape Institute Awards. In the face of climate change and urbanisation, the annual LI Awards continues to honour those working in the UK to preserve and enhance the natural topography of our earth. The project which nabbed the top honours of the revered President’s Award was The Green Infrastructure Action Plan for Pollinators in South East Wales, a plan formulated by TACP Landscape Architects outlining ways to enhance biodiversity in order to encourage bees. Where there are bees there’s usually a hive, and winning the Design for a Temporary Landscape Award was The Hive at Kew Gardens, designed by BDP with Wolfgang Buttress, a sculpture which hosts wild species of flowers and plants as well as cultivating a safe space for bees. Meanwhile in Milan, the Piazza Gae Aulenti by AECOM at the Porta Nuova Garibaldi development won the Design for a Medium-Scale Development award. At the heart of the piazza, a vast reflective water installation enhances the urban landscape and encourages community exchange. Meanwhile, the Crown Estate London Ecology Masterplan by Arup and the Crown Estate, which picked up the award for Landscape Science, Management and Stewardship, created plans for a green corridor through central London, holistically improving the experience of commuters and residents. 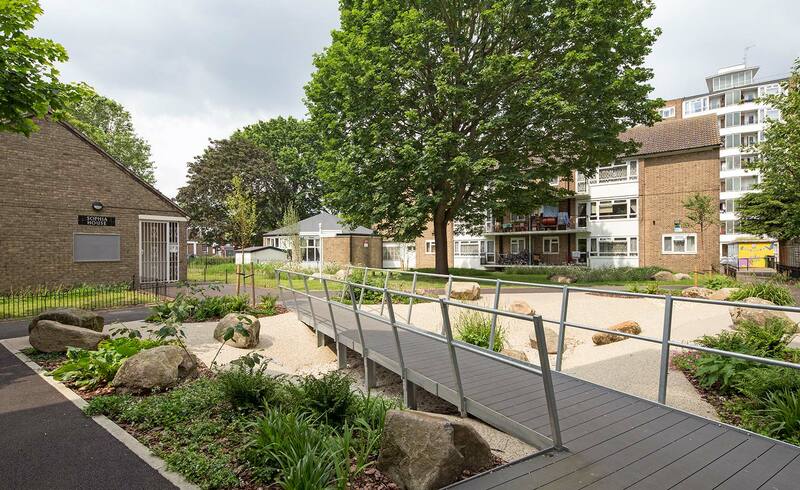 Social projects included the climate-proofing of housing developments in London’s Hammersmith & Fulham by Groundwork London, who won the Fellows’ Award for Climate Change Adaptation; and the Colour for Royal Stoke Hospital, a project designed to enhance the recovery of patients which scooped the Design for a Large-Scale Development award. Several awards focus on innovative research and planning such as The Local Landscape Planning category which went to LUC for the Woodside, Firhill & Hamiltonhill Development Framework, a plan created in collaboration with a community in north Glasgow which resulted in a new local reserve. The Landscape Policy and Research award went to Capita Lovejoy for its two research studies – ‘Trees and Design Action Group’ – which explore concepts for integrating trees into the urban framework.